SGD offer online jewellery portfolio. Kolkata-based Senco Gold and Diamonds (SGD) on Thursday announced launching of an exclusive jewellery portfolio available with e-tailer Amazon.in. Kolkata : Kolkata-based Senco Gold and Diamonds (SGD) on Thursday announced launching of an exclusive jewellery portfolio available with e-tailer Amazon.in. The partnership gives the city-based jeweller access to the pan-India market. "The range of products which is available exclusively online is priced between Rs 7,000 to Rs 150,000," Suvankar Sen, executive director of SGD, told mediapersons here. 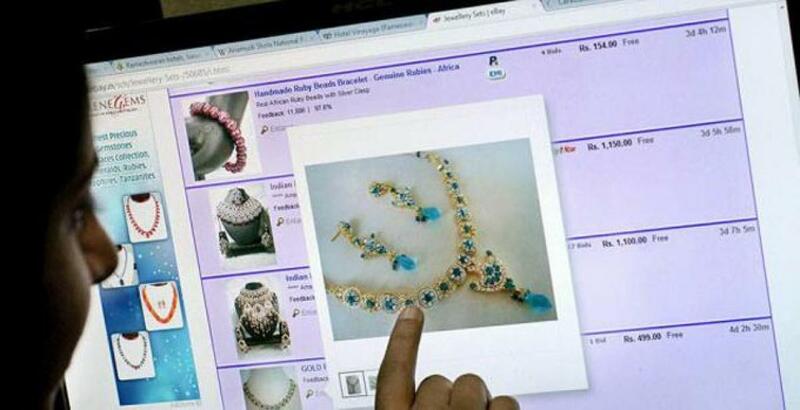 The online shopping portal is sharing user behavioural and analytical data reflecting the customer's or surfer's tastes and preferences with the jeweller, based on which the ornament designs are rolled out. Until now, 460 products of SGD are listed on the portal. The jeweller is expecting the majority of sales to happen in the Rs 7,000-Rs 40,000 price band in the coming months. Sen said that apart from 22 carat gold coins, neckpieces like mangalsutra (black beads with gold worn by married women in India) and American diamond studded jewellery is expected to drive demand in online sales. "Since the launch of precious jewellery in December last year on the portal, we have seen a growth of 300 percent. Sales in this segment increased by 5-6 times in the festive season as compared to the normal time", category leader at Amazon Fashion India, Mayank Shivam said.